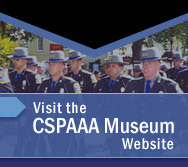 The following links are provided as a reference tool for CSPAAA members and the general public. The Connecticut State Police Academy Alumni Association does not promote or condemn any of the materials contained within these sites. If you would like to suggest a link for inclusion in this site, please contact us. The Connecticut State Police "an unofficial home page"
Police Certification Provides a clearinghouse of Connecticut's municipal police departments and their job postings and hiring schedules as well as vital information on physical ability assessment testing. Connecticut State Police Emerald Society The Connecticut State Police Emerald Society is a fraternal society dedicated to the preservation and promotion of Irish history, Irish culture and for the furtherance of the highest standards of professionalism in law enforcement. The Connecticut State Police Emerald Society has now been established and is looking for a few good members. This is a good time to consider joining what is going to be one of the best social and fraternal organizations in law enforcement.